If you’ve been to Connections Nightclub or The Court Hotel while drag performers are working the stage, there’s a very high chance you’ll recognise the subject of this interview. Photographer, anthropologist and academic Claire Alexander is a fixture of Perth’s drag scene, documenting our local queens and touring RuPaul’s Drag Race girls alike – with a keen eye for the captivating and a true love of the art form. Now on the brink of completing her PhD with a focus on drag and gender, Alexander’s images and musings have been published in a chapter of a new book entitled RuPaul’s Drag Race: Shifting the Visibility of Drag Culture and the Boundaries of Reality TV. Alexander sat down with Leigh Andrew Hill to talk about her academic findings, her passion for drag and the connections she’s drawn between Perth’s drag scene and the international phenomenon of Drag Race. 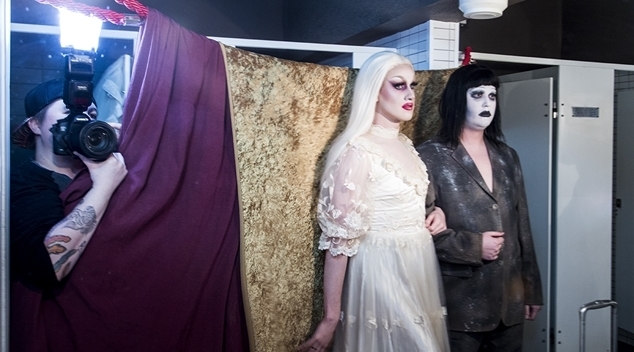 Perth’s queer community knows you as a drag photographer – What sparked your initial passion for drag as an art form? It all started with Hannah Conda. I was looking for a person to make a short documentary piece about, someone who would be a really interesting and engrossing character, and I was a little lost for inspiration. Then one day I went to Bingay at Connections, and Hannah was hosting. She was such a fun and captivating host, so I asked her whether she’d feature in my piece. She said “yes”, and it all spiralled from there! Shortly after that, I started shooting Drag Factory at The Court, and the rest is really a blur, in that it happened so fast… I started a PhD focused on drag, I went to LA to shoot Drag Con, and went on to shoot two drag cruises, one in the Mediterranean, and one in the Caribbean. I started exhibiting drag portraits internationally, and just in general, everything has been about drag and drag culture for me since then. How did you come to start analysing drag from an academic perspective? My first degree was in anthropology, and in those early years I started thinking about the constructedness and performativity of gender thanks to theorists like Judith Butler and Jack/Judith Halberstam. Later on, I started to add documentary photography to my methodology, which makes my approach more visual ethnography. Being queer myself, and already on the fringes of the LGBTQI+ community, allowed my presence in the drag community to be a generally welcomed one, and from there, thinking and writing about drag was a pretty natural progression. What exactly do you cover in your chapter of this book? I explore the ideas of a group of local Perth queens who entered the Perth drag scene at various stages of its development, from about 1980 to the present day. I discuss the changing face of Perth drag in light of RuPaul’s Drag Race, drawing on themes presented to me by the queens, including their personal histories and inspirations and their general knowledge of drag history. I also explore perceived changes within the wider queer and non-queer community, and adaptations made to adapt to the ‘new ways’ of doing drag. I use an ethnographic approach to explore the growing popularity of RuPaul’s Drag Race, and talk about its multi-faceted influence on the local scene. I basically discuss the changing face of Perth drag in light of RuPaul’s Drag Race. The nine drag performers whose voices are heard in this chapter are Stryker Meyer, Champagne de Ville, BarbieQ, Feminem, Hannah Conda, Veronica Jean Jones, Ruby Jewelz, Perri Oxide, and Harvest Dubois. How have you seen the culture of/conversations around drag change in the last decade? This is exactly what I write about in my chapter—except from the queens’ perspective, and divided into a few key areas. I think RuPaul’s Drag Race has undeniably increased the number of conversations about drag and the prevalence of drag themes in mainstream culture. Wow, I can’t believe there have been so many seasons of the show already… Has it almost been a decade? Many of the queens in your work are from RPDR. There are some criticisms that show has homogenised the art form – how do you respond to that? I don’t think that’s true. I definitely think there’s way more room for mimicry in drag, but I think that was always happening, it’s just on a much larger scale now because of the ease with which information can be shared. With RPDR, Youtube and social media, people just have a lot more access to drag than they ever have before. The effect of that, I think, is to bring gay culture into the mainstream, which is a positive thing. I think artists will always be copying and learning from what they’ve seen, but it takes talent and originality to stand out from the crowd! How have you seen the Perth scene evolve over your years observing it? I’ve definitely seen a huge influx of queens over the years, and there’s no doubt that RPDR has played a significant role in influencing both the number of new queens on the scene, and what/how they perform. Actually, in my chapter I interview Perri Oxide who talks about how she started drag, and the influence of Max on both her aesthetic and confidence in pursuing drag as an art. Drag queens have also been embraced by small sections of the majority population, and a lot of queens are getting work in fields they wouldn’t have before. I’ve seen a lot of shifts in how drag is transmitted, and changes in drag family structures (Barbie, VJJ and Ruby also talk about this in my chapter). What elements do you think make a drag performer stand out on the stage and through the lens? Would it be a cop out if I said charisma, uniqueness, nerve and talent? I think a variety of different qualities make different performers stand out. I would say that having a confidence in your art despite what others may think really stands out to me. That comes across as a resolve and groundedness in what you’re performing. That, and know your words. How can the drag community and their fans help spread the love at a time like this when the nation is having a conversation about our rights? Drag queens have always been trailblazers in our community when it comes to visibility and our rights. I think they’re already doing a lot to bring people’s attention to the injustices we face, and are facing right now specifically with marriage equality. In the last few weeks at Drag Factory, performers have been doing Pride and equality themed numbers, and I’ve seen lot of posts on social media from popular queens about getting registered and updating electoral role details. I really think being as political and vocal as they can be will really help our cause… people really look up to them, and will be looking to them to take the lead. It takes a lot of strength to be a drag queen, and to do what they do regardless of disapproval from mainstream society. I think their very existence reminds us to keep fighting as a community.